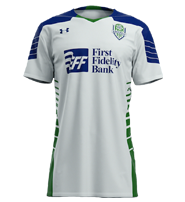 First Fidelity Bank is proud to be a Founding Partner and Jersey Sponsor for the Oklahoma City Energy FC. We are honored to put our name behind this team and its players, and Oklahoma's already strong sports community and rich soccer traditions. Soccer is a fun, family-oriented, healthy pastime that we really identify with. First Fidelity Bank is a family owned and operated bank, based in Oklahoma City. Our focus has always been on being a partner to the people and businesses here. With over 90 years of support to neighborhood partners, First Fidelity Bank believes that supporting our community is an important responsibility, and our goal is to help foster growth and goodwill in our city for years to come. "The Oklahoma City community has a rich soccer history, and even in our own family, we've spent a good portion of our lives on the soccer field," said First Fidelity Bank Owner Lee Symcox. "We are passionate, not only about this community, but about the sport. This partnership is just one of the ways we can support our city, our clients, and soccer fans like us." Tickets for OKC Energy FC are available by calling the Energy FC office at 405-235-KICK (5425) or by visiting www.energyfc.com. Energy FC is led by Head Coach Steve Cooke and is a part of the USL Championship, one of the largest professional soccer organizations in North America. The club was founded in 2013 and played its first season in 2014. Energy FC makes its home at Oklahoma City's historic Taft Stadium and is entering its sixth season in 2019. USL PRO is the strongest, best operated and most experienced North American men's professional soccer league outside of Major League Soccer (MLS). Focused on franchise stability and longevity, USL PRO features 15 teams for the 2014 season, including expansion teams in Oklahoma City and Sacramento. Presently 10 USL PRO teams have direct affiliations with Major League Soccer clubs. The league not only serves as a springboard to the MLS for players, but also for franchises. Five of the last six clubs to enter MLS have moved up from the USL's top professional division. Among the most successful clubs, the Vancouver Whitecaps, Seattle Sounders, Portland Timbers, Montreal Impact and Orlando City SC all operated franchises in the USL's top professional division before making the transition to MLS.